Verona Green Earth, extra fine | KREMER-made and historic Pigments | Pigments | Kremer Pigments Inc.
? Products with this icon are Kremer self-made. 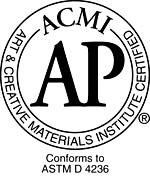 Products bearing the AP Product Seal of ACMI are certified in a program of toxicological evaluation by a medical expert to contain no materials in sufficient quantities to be toxic or injurious to humans or cause acute or chronic health problems. LABELING CONFORMS TO ASTM D-4236. THIS PRODUCT IS NOT A TOXIC OR HAZARDOUS SUBSTANCE AS DEFINED BY CFR 1500.3 OF THE FEDERAL HAZARDOUS SUBSTANCES ACT. IT DOES NOT REQUIRE ACUTE OR CHRONIC HAZARD LABELING. Customer evaluation for "Verona Green Earth, extra fine"